Curry leaves is easily found. It has very good taste. There are several benefits of curry leaves. • The fresh curry leaves has good aroma. This reduces if you keep it in refrigerator. Therefore, always use fresh curry leaves. • Many people avoid having curry leaves. However, they should eat it. It is very nutritious. Curry leaves contains magnesium, calcium, phosphorus, iron, copper and vitamin. • Liver is very important part of the body. Curry leaves makes liver powerful. 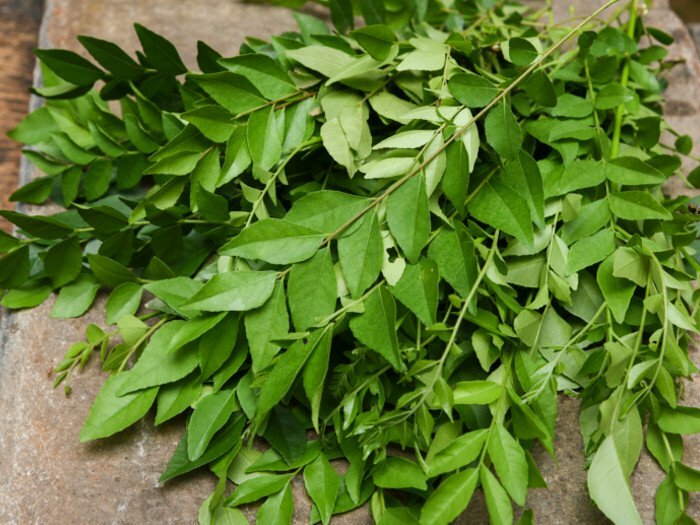 Curry leaves avoids bacteria or viral infection. It also avoids free radicals, hepatitis and psoriasis. • Curry leaves has enough amount of vitamin A. Vitamin A is very important for eyes. The lack of vitamin A creates problem in vision. Therefore, curry leaves is very beneficial for eyes. • Curry leaves reduces LDL cholesterol level. The high amount of LDL cholesterol creates heart disease. • Curry leaves moisture the hair. It cleans the hair and it increases the growth and strengthens the hair. Mix curry leaves powder in sesame or coconut oil. Boil this oil and massage it in hair. Keep this for overnight and wash it in morning. • Curry leaves contain anti-oxidant and phenols. This avoids cancer. The special element of curry leaves avoids leukemia, prostate cancer and colorectal cancer. • Curry leaves has iron and folic acid. Therefore, it avoids anemia. • Curry leaves reduce sugar level in blood. It contains fiber that also reduces sugar level. Curry leaves improves digestion and reduce weight. • Curry leaves has high amount of anti-oxidant, anti-bacterial and anti-fungal property. It is beneficial for skin. It avoids skin infection.